This Clovis point was found by Frank and Alice Estergreen in the 1950's in the vicinity of the Dietz Clovis site near Alkali Lake. 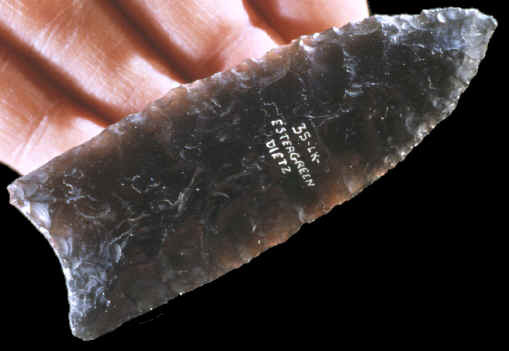 A trace element analysis was done on this projectile point and it was determined that the Obsidian source was Glass Butte, Oregon. This Clovis point has "hafting abrasion scratches" in the basal hafting area. 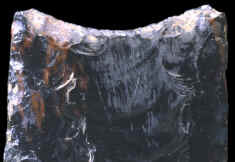 The side with the largest channel flake has the most abrasion. This channel flake measures 1 1/2 inches (3.8 cm) long and 5/8 inch (1.5 cm) wide. There is also a long narrow flake removed at the tip of the point on one side that measures 11/16 inch (1.7 cm) long. This may be an impact fracture. This Clovis point is made of semi-translucent black Obsidian and it measures 3 3/8 inches (8.5 cm) long. The pictures above show the original Clovis point from Lake County, Oregon. The picture on the left shows both sides and the picture on the right shows a magnified view of the "hafting abrasion scratches." This fluted point has "hafting abrasion scratches" in the hafting area. A small percentage of Obsidian Clovis points have these scratches. This "roughening" of the slick surface would have helped to secure the projectile point more solidly to the shaft. Roughening of the hafting area on Obsidian Clovis points has been observed over a wide area in the western U.S. 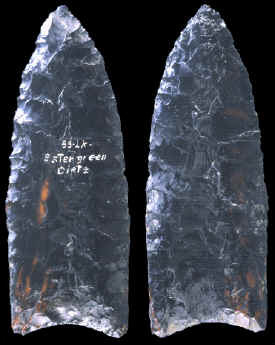 Some of the original hafting glue or "mastic" was discovered in the hafting abrasions on a Clovis point found in Oregon.